Henry’s McIntosh amplifier, which according to Tom and Henry has seductive powers. 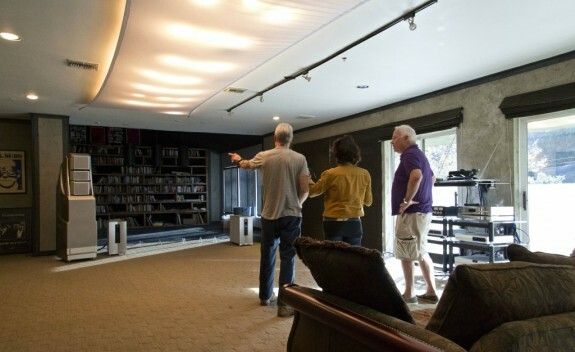 Henry Rollins leads Tom Schnabel and Frances Anderton on a sonic tour of his high-fidelity audio-equipped home. Henry Rollins shows Frances Anderton, and Tom Schnabel, right, his Wilson Alexandria XLF speakers. If you listen to KCRW’s music shows hosted by Tom Schnabel (Rhythm Planet) and Henry Rollins (Henry Rollins), you might think that they are two very, very different guys — Henry delivering an extreme diet of raucous punk while Tom bathes us in his refined world music selections. But scratch the surface and you will find they are brothers under the skin, truly passionate “audiophiles” — “fanatics” would be Henry’s word — as DnA found out when Frances Anderton joined Tom recently on a wild sonic tour of Henry’s home. Tom suggested that we join forces and visit Henry in his tower of power, and on an afternoon in early November, off we went to meet Henry in his house at the top of a scarily steep, curving drive high in the hills. There we found a man who lives an almost monastic life, devoted to the God of rock ‘n’ roll. Henry’s McIntosh amplifier, which according to Tom and Henry, emits seductive powers. 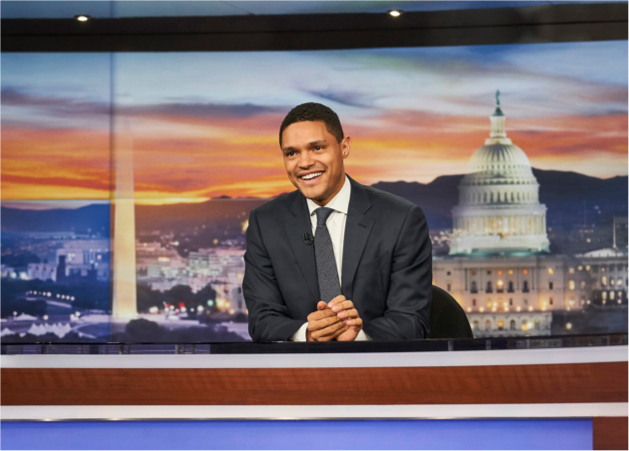 Henry’s rapid-fire, passionate delivery would have been ceaseless but for interjections from Tom, who proved to be Henry’s equal in audiophilia. The pair were off the races swapping notes about music and music-technology; I was merely a bystander. We wound up spending almost two hours in Henry’s headspace, on a trip that truly was a trip. Listen to the tour here or on the audio above, and read Tom’s blog here. And send us your thoughts about audio systems and what works best for you. 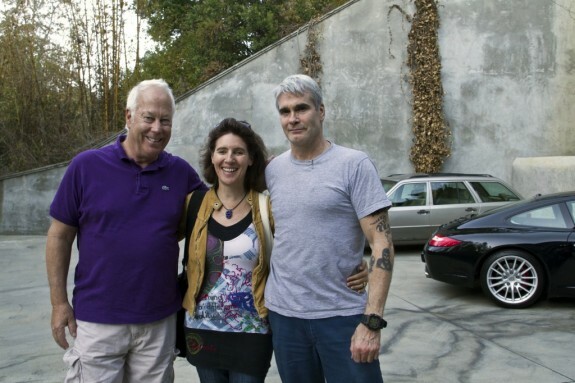 Tom Schnabel, left, with Frances Anderton and Henry Rollins. All photos by Camellia Tse.